To get the most from SeeDeClip4 it's required to know what it is to a deeper level than with a regular application. Once installed on your PC it is just an application of course, but all the info and audio is not directly sent to the various bits in the PC, but instead it's sent into network 'sockets', to travel on the yellow brick road or 'Networking Layer' in the diagram below..
As you can see, SeeDeClip4 reads your music and then talks to the Networking Layer. This is both the reason for it's flexibility and scalability, but also a source of huge confusion. In this diagram the PC itself has got a nice view of the tracks up on the screen and is currently playing AC/DC's Kissin' Dynamite through the speakers. The actual SeeDeClip4 program is merely streaming rather boring text and binary data streams into the Networking Layer, it's the browser that reads this data and converts it into lists, art and music for us. 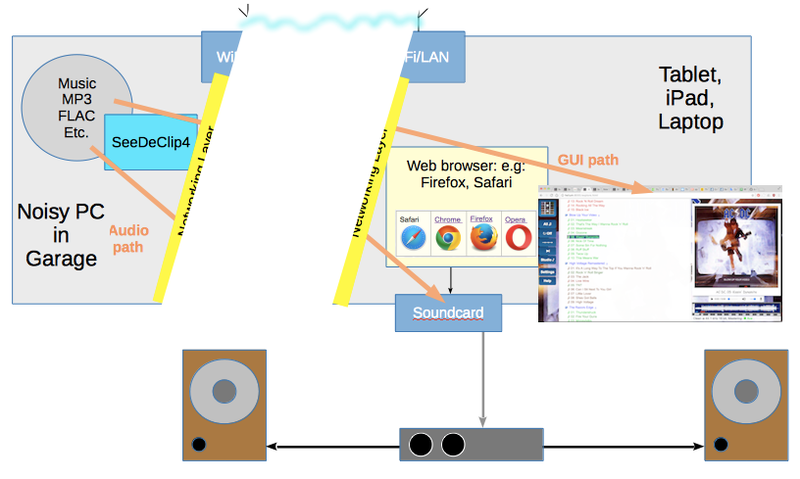 The orange GUI path and Audio path shows the overall path of info and music as it reaches you, the user. Imagine this yellow Networking Layer layer as a road, with a series of little delivery vans. The info (artwork, lists etc) + audio data is chopped into packets and send in the trucks to the specified address. In this case the trucks only have to drive across the road, so it's very fast and the WiFi is not used. Now imagine a distant iPad on the Wifi asks for some info + music, in that case the requested data is not shipped across to the other side of the road, instead those little trucks zip up the road to the WiFi terminal and the data gets loaded onto the airwaves and sent out over Wifi to the iPad. It's like a giant postal system. In fact that's why they are called packets. This yellow brick road de-couples SeeDeClip4 from your PC. Sure you can access it from your PC (driving those trucks just across the road), but you can also access it from anything on your local WiFi/LAN too, even at the same time. Imagine figuratively snapping your PC in two along that yellow Network Layer on the diagram, the LHS could then be a cheap fast (noisy) PC in the garage and the RHS could be a laptop in the study or/and an iPad in the lounge at the HiFi. Neither side would really know the difference, just the address changes and the journey takes a few ms longer..
A browser can find and drive the audio on devices with HiFi quality (except for Microsoft IE). 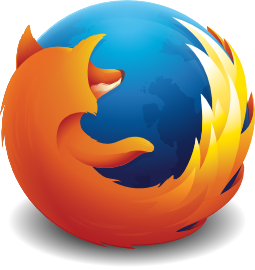 The boring stuff to send web browsers is very well documented and standardised. The program has to only be written and maintained once, to be accessible from any device with a decent browser. Techies often refer to this Networking layer as 'TCP/IP' and access them by things called 'Sockets'. Each device on your local LAN/Wifi will have a local address, these local addresses are a special limited subset of possible addresses that are locked out of the internet. There are two local address regions, 192.168.X.X and 10.0.X.X. Which ones your computer uses is as abitrary as your own house number on your street, and largly irrelevant because when SeeDeClip4 starts, the address will be visible in the home page of Seedeclip4 which opens when you press 'Start'. These local addresses are how those little trucks on the yellow brick road know where to bring the requests for data and where to deliver their packets, just like the local post office. The internet is full of websites that you browse with a 'web' browser. In fact you are doing that now because you are reading this info. One may assume therefore that all websites live on the internet. This however is false, and a 'web' browser is really an HTTP/HTML browser. For instance work may have a company intranet on the company LAN (LAN = local area network), usually with Wifi too. It will be a fascinating website of mugshots and mission statements. That will just be running on some PC jammed into the server room in IT. So what is SeeDeClip4? Well, it's a small music website that you install on your PC so you can listen to your music anywhere in the home. 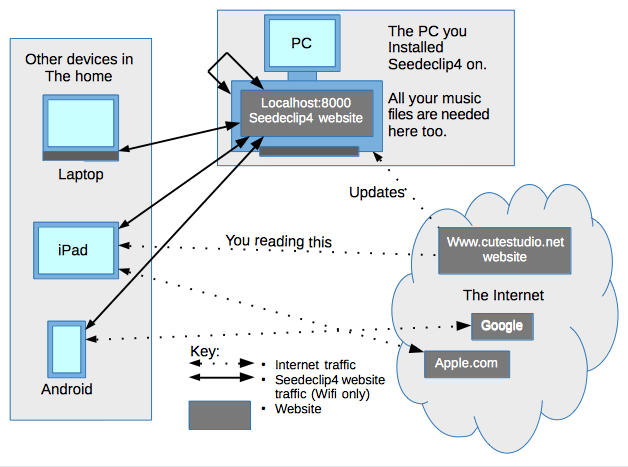 As you can see in the diagram, internet traffic is seperate and unrelated to any LAN traffic like SeeDeClip4 streaming songs etc. 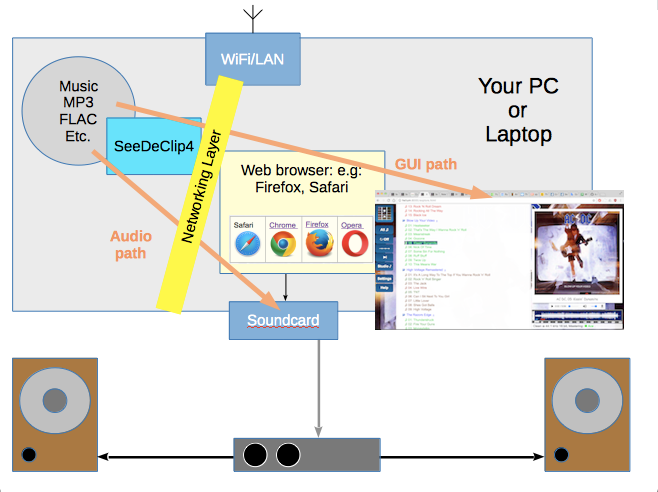 Listening to songs on SeeDeClip4 doesn't use the internet so your internet bandwidth and data is unaffected. Apple's Safari and Microsoft's IE and Edge won't support HTML5 HiFi audio, you may have trouble with Blackberry and Windows Mobile too. Please study the two sections above to gain an understanding of what SeeDeClip4 can do you you. It takes a while to 'get it', but when you do you'll never go back to device based players. Does it need the internet? The dotted lines in the internet diagram above No. Once installed and updated the internet is not required unless you want to download image artwork or download a program update. For instance when you upload your Pro/Lite key to SeeDeClip4 it just gets uploaded to your own PC that's running SeeDeClip4, because that's where the website lives. In your own PC, on your own LAN. Does it use my Wifi? then Wifi is needed to stream the music across. Why would I use SeeDeClip4? Try accessing a 300GB music library - on a noisy PC in the hallway - from a tablet on the sofa - with the declipped sound coming out of your HiFi across the room - with a conventional media player. For Hi-Fi buffs the remote / slave feature is most useful, you can be sitting on the sofa with a tablet playing the sounds on your Hifi with another phone/tablet/PC sending the audio out. Keeping a noisy PC out of the listening area is also a huge benefit. Once read in SeeDeClip4 can then stream and/or present the waveforms for both before and after, and some views like the Studio and Explore/Track view allow you to compare them side by side. SeeDeClip also gives you views by track, playlist, album and artist, and the Studio view. Below is the track view, just click on the waveform below the artwork. SeeDeClip4 does not write the processed files back to disk, the concept is that your disk files stay original so that when you change settings or the declip algorithm is improved you immediately get the benefit. The WAV output is an uncompressed HiFi format which includes high sapmle rate 24bit waveforms. From the Studio page you can download the de-clipped (WAV) track if you need the audio file in it's declipped form (Declipping is a Lite/Pro feature). Below is the Studio with a dodgy remaster (remasters are usually much worse than the original, in this case the original was perfect).